No one likes a one-trick pony. 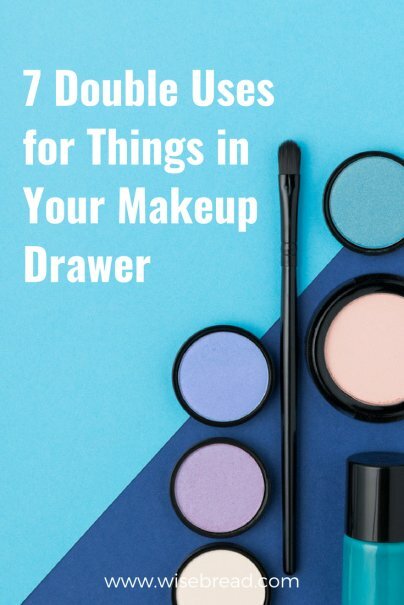 If you've got some items rolling around in your makeup drawer that you rarely use or are long expired, then you might be surprised at what else you can do with them. Put the following items to good use, and save yourself some serious coin. Mascara should be thrown away every few months since bacteria and eyes just don't mix. There's a good chance you've got a bottle lying around past its prime, but luckily there's another use for the wand. Wipe off as much mascara as possible and wash well with soapy water for a great eyebrow brush. You can use it the exact same way to comb and shape eyebrows, and greatly extend the life of your mascara wand. Most everyone goes through an eyeshadow phase where you end up buying every color imaginable. And most everyone ends up finding a few select colors that they regularly wear, if they wear any at all. What to do with all of that extra eye shadow? Make it into paint! You'll just need a bit of white paint and textile medium to transform your eyeshadows into a bright, brushable craft supply. Crush up your chosen color, mix it with the other ingredients, and paint a masterpiece. It's a weird trick, but hairspray is mighty good at removing grease and oil stains. Spray hairspray on the stain until saturated and let sit for a few minutes. Dab with a damp cloth to help lift the stain, and then wash the garment to remove any residue. It even works on pesky lipstick stains. If you're running low on dry shampoo but your hair desperately needs a touch up, use translucent face powder. Tap a small amount onto the roots of your hair and work in with your clean fingers, a powder brush, or a combination of both. Be sure to hold your head over a sink to catch any excess. It's great for quick touch-ups just around the face with a brush. Clear nail polish is the superstar of the makeup drawer multi-taskers. It works really well as a sealant, protecting whatever you're painting with a clear coating. Try applying a coat to items with metal bottoms that could rust on your counter or in the shower, like shaving cream. Paint a coat on your cheap costume jewelry to keep them from chipping or leaving green marks on your skin. And apply over small rhinestones on low-cost jewelry or sunglasses to keep them from falling out. You can also use it to waterproof small things, keep frayed items from unraveling, and simplify threading a needle. Your powder, blush, eyeshadow, and eyeliner brushes need to be cleaned regularly to stave off bacteria. This is especially true for anything that's going near your eyes. After a while, you should replace your brushes and swap with new ones. Rather than simply tossing the brushes, give them a new life as craft brushes. Use for paint, glue, glitter, and more. Use liner brushes to apply small amounts of glue to delicate items or paint detail work. A thin eyeliner brush is also great for painting on fun nail art. Makeup remover isn't just good at removing makeup, it's good at removing stains, too. Use remover to clean up makeup mishaps on wood, vanities, floors, and more. It also works as a gentle cleaner on hands and many other surfaces with oil or wax-based stains. Spot test your makeup remover before using, but most are non-abrasive since they are safe to use on your face. What other makeup tool hacks do you employ? Tell us about them below! Another use for unused eye shadow is to turn it into your personal homemade nail polish. Simply crush the eye shadow into a powder and add to a bottle of clear polish, shake well, and that's it! You can add glitter, sparkles, etc. for a customized polish.